The organisers of the annual FOCUS Wales Music festival in Wrexham, North Wales have teamed up with Wrexham County Borough Council to create a brand new outdoor event. 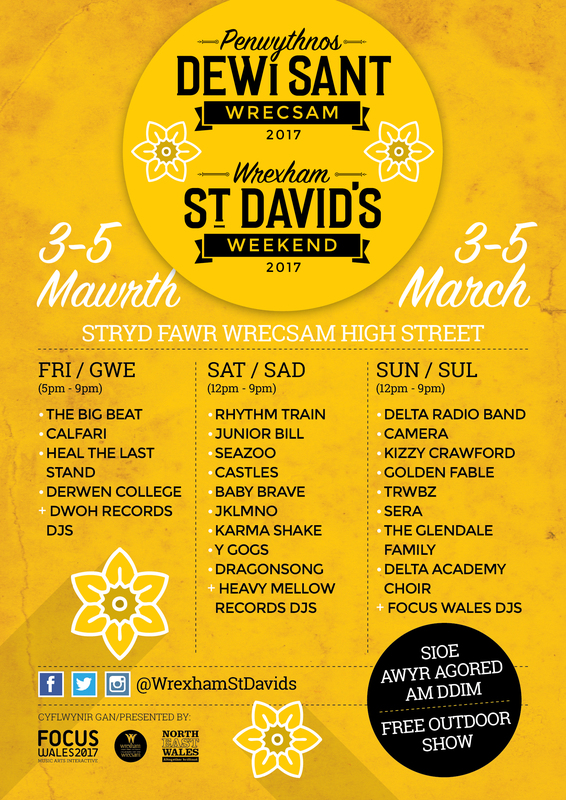 ‘Wrexham St. David’s Day Weekend’ will take place on Friday 3rd, Saturday 4th and Sunday the 5th of March 2017, taking over Wrexham’s High Street and presenting live music throughout the three days. The new event is a celebration of welsh culture and will mark the national patron saint’s day with a fun packed and high profile outdoor show, which will feature the best up and coming bands from around Wales and the North West, as well as bespoke food stalls and entertainment for all the family. The event will also be completely free of charge to attend! More information, including showtimes and line ups for each day and the town centre location will be announced soon, watch this space! 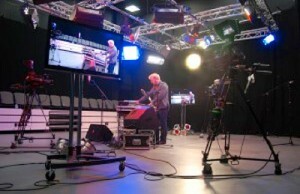 In the run up to FOCUS Wales 2016, we are working in partnership with Glyndŵr University to present a series of unique live performances at the ‘Centre for the Creative Industries’ – during which performances will be filmed and recorded for broadcast at a later date. Principle lecturers of the ‘Television Production and Technology’ & ‘Studio Recording and Performance Technology’ courses at the university are working closely with FOCUS Wales to deliver this project, which gives audience members the unique opportunity to experience the process by which live music broadcast sessions take place. FOCUS Wales have partnered with Glyndwr University, Wrexham, for the delivery of an exciting guest lecture from Metallica sound engineer Mick Hughes. The Big Mick Hughes ‘Mixing Metallica’ lecture takes place at Glyndwr University, Plas Coch Campus, Wrexham, on Friday 4th December 2016 at 1PM. FOCUS Wales and Music Glue launch new Welsh language version of the platform. FOCUS Wales have partnered with Music Glue to provide a Welsh translation for the Music Glue platform making it the 12th language to be added to the service. This exciting addition means that for the first time Welsh artists, promoters, labels, festivals and venues can sell tickets, merchandise and digital products to Welsh customers in the Welsh language. FOCUS Wales co-director Neal Thompson said “We’re very proud to be able to team up with such a respected brand as Music Glue and for the first time, to be able to offer artists and music based businesses the opportunity to communicate with fans and customers and to sell their products entirely in the Welsh language across the globe”. Joe Vesayaporn, Squadron Leader at Music Glue said “Having attended Focus Wales over the past few years we are really excited to be an official partner for 2016. Focus Wales is a great event allowing the best up and coming talent in Wales a place to showcase their talent. With the addition of Welsh to the platform we expect many more Welsh acts benefit from the service”. FOCUS Wales festival teamed up with local businesses The Leader and Dee Valley Water to deliver children’s music and arts workshops in Wrexham. The first event was held on Saturday 25th April, as part of the FOCUS Wales festival, where children learnt to play the drums with professional musicians, and got crafty with the help of THIS Project. Thanks to the commitment of local businesses plans are currently underway to replicate these free community events as part of FOCUS Wales Festival 2016, reaching an increased number of children from the community, local schools and organisations such as The Venture in Caia Park. Keep an eye on www.focuswales.com for information about similar future events. We are proud to be partners of the STARS project, working together through offering volunteer opportunities for all during the festival. The STARS (Striving Towards Achievement, Recognition and Success) Project is a Families First, Wrexham Council funded initiative delivered by the Caia Park Partnership which went live in early 2013. Its mission is to enable the personal and socio economic development of vulnerable people aged 16-25 who are Not in Education, Employment or Training (known as ‘NEET’). STARS aim’s to improve the quality of life for vulnerable people and their families who live in the Wrexham area by enabling them to aspire and achieve. All participants engage of their own free will and are working hard for a better quality of life. The STARS Project operates a person centred approach and works with partner agencies to deliver a bespoke programme to all participants. This year FOCUS Wales are collaborating with ‘Vic Studios’ at Wrexham Victoria Youth Centre, to present the ‘Introduction to Remixing’ project. This project offers 10 young music enthusiasts the opportunity to partake – FREE of charge – in the 2 hour micro course, which offers participants the opportunity to learn the basics of music remixing. The sessions take place at the Wrexham Victoria Youth Centre (13 Hill Street, Wrexham, LL11 1SN), and are presented by Course Director and Studio Co-ordinator Mike Harmina. Participants who successfully complete the course are rewarded with a FREE FOCUS Wales Festival Wristband, granting free access to the festival. Successful participants are also awarded an OCN ‘Introduction to Remixing’ Level 2 qualification certificate. Based in The Victoria Young People’s Centre and funded by Wrexham County Borough Council, Vic Studios is a music project aimed at providing affordable rehearsal and recording facilities to musicians of all styles, ages and abilities. Consisting of two fully-equipped rehearsal rooms, a recording studio and a DJ suite, the project regularly facilitates rehearsal and recording sessions for a large number of local bands, singers, musicians, DJs and MCs . 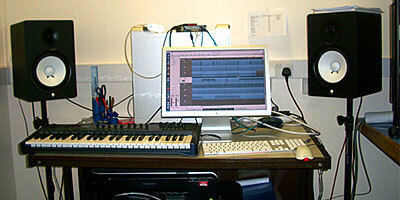 As well as opening its doors to practising musicians, Vic Studios also provides educational opportunities for individuals referred by voluntary and statutory organisations such as the NHS, mental-health-care charities, the Youth Justice Service, Children in Care, specialist schools and drug/ alcohol services.